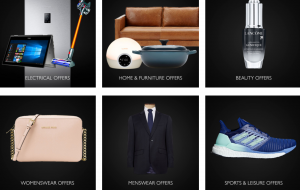 The John Lewis & Partners Black Friday event is live. Get a head start on your Christmas shopping and enjoy low prices and amazing offers on electricals, womenswear, home and furniture, menswear, beauty and fragrance, toys, sport and leisure, nursery offers and more. Don’t miss out, shop now. Grab yourself a fantastic deal on a wide range of products with Marks and Spencer offers. Shop for furniture, clothing, flowers, food and wine all with selected discounts and savings. Shop online and collect your order from Marks and Spencer in the Canary Wharf shopping centre. You can order clothing, beauty or homeware online and it will be delivered to your chosen store for free. Simply order by 8pm for next day collection from your chosen store. Your order will be ready to collect from midday and Marks and Spencer will keep it in the store for 7 days. Food orders will be ready to collect on your selected day from 9am. Fancy UK mainland delivery instead? It’s free for flowers, plants, selected food and wine gifts and most furniture. Next day home delivery is only £3.99 when you order online up until 10pm for clothing, home and beauty items only. There is free standard home delivery on orders over £50 – get your clothing, home and beauty order within 3-5 working days. Get free standard home delivery within 3-5 working days on wine orders over £100. Or there is free nominated day delivery on wine orders over £150 – simply select the nominated day delivery option and your chosen date at checkout. Next day delivery is available when you order before 7pm.